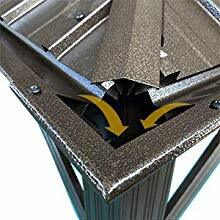 Dark brown colored rustproof aluminum frame, which is very strong and sturdy, built with 4.7“x4.7" triangular aluminum stand pole, much bigger and stronger than standard models. All materials are built to last, never becoming rusty or deformed. Hard metal top instead of normal fabric or polycarbonate material. 5 years warranty on the hardtop roof. 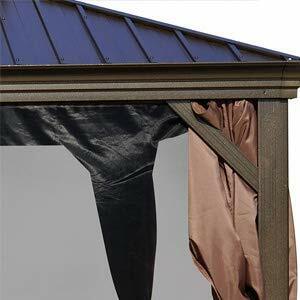 Extremely durable PBV-coated polyester mosquito netting and removable steel railing on 4 sides. 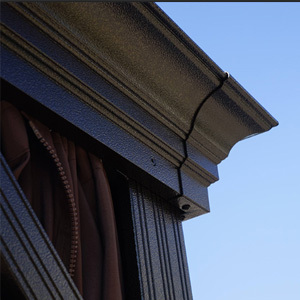 Double Track System allows you to add another layer of privacy sidewall. Include 2 layers sidewalls (mosquito set and strong 180gsm polyester solid sidewall). Better ventilated than one layer design. Galvanized steel roof strong enough to withhold any heavy snow. Better water gutter design to ensure rainwater always goes inside of poles and the edge frame. Introduce the glamour and comfort of a resort experience into your everyday life. 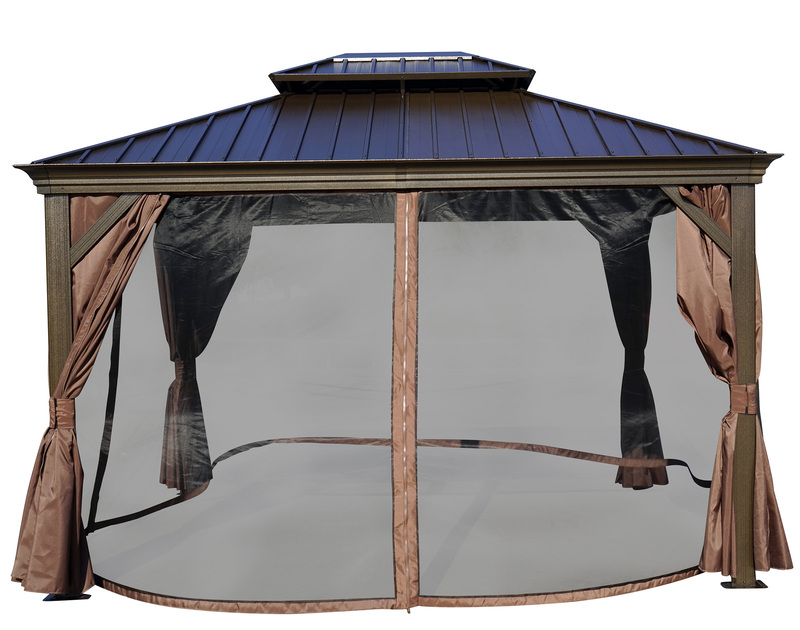 The Alexander Aluminum Gazebo elevates your backyard, or other outdoor space, adding an element of comfort and sophistication that’s certain to impress your guests. The classic design adapts well to many styles of patio furniture. 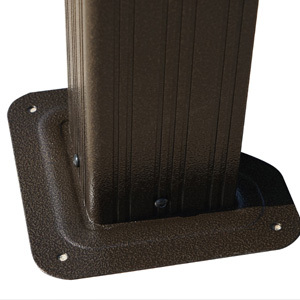 Triangular Aluminum Stand Pole 4.7"x4.7" 3.85"x3.85" 3"x3"
Dark brown colored rustproof aluminum frame, very stable and sturdy, built with 4.7"x4.7" triangular aluminum stand pole, much bigger and stronger than standard models. All materials are built to last, never becoming rusty or deformed. Advanced water gutter design to ensure rainwater always goes inside of the poles and edge frame, and then flow to the ground. Avoid any troubles or worries at rain season. 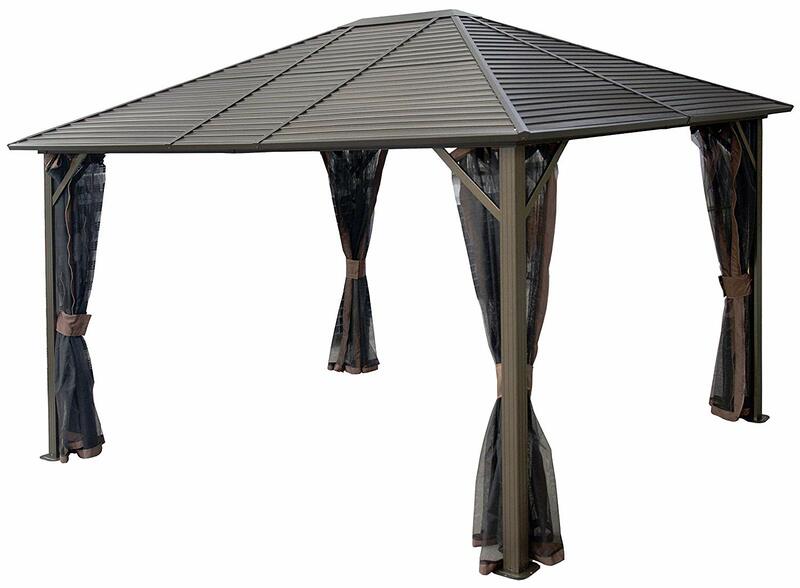 Targeted design to keep the gazebo always in excellent condition and extend the service life. Beautiful hard metal top instead of normal fabric or polycarbonate material. Perfect choice for family and friend meetings, dinner parties and wedding ceremonies. 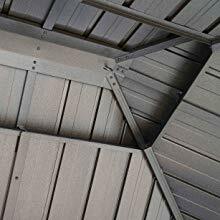 Compare to a traditional soft top, this kind of roof is strong enough to withhold any heavy snow and offer unbeatable stability in windy conditions. Strong anchoring stand with 3 pre-drilled holes designed to easily fix with any kind of floor for sturdy installation (Screws are not included). You need to choose suitable screws depends on the kind of floor you have. An extra cupola adds at the top to create a two-tiered roof which improves the airflow for more ventilated and more comfort. Meanwhile, internal mosquito netting will block off insects to give your family and children safe and cozy surroundings. Extremely durable PBV-coated polyester mosquito netting and removable steel railing on four sides. Double Track System allows you to add another layer of privacy sidewall. 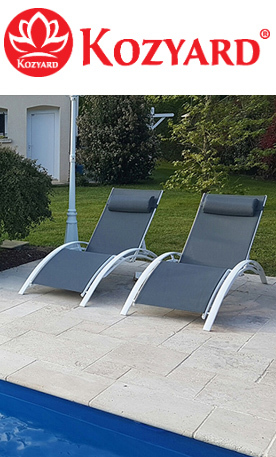 180 gsm polyester solid sidewall with zips protect you from UV rays and also create a private space for you and your family. Kozyard has no liability for incidents regarding potential high temperatures occurring beneath the gazebo. 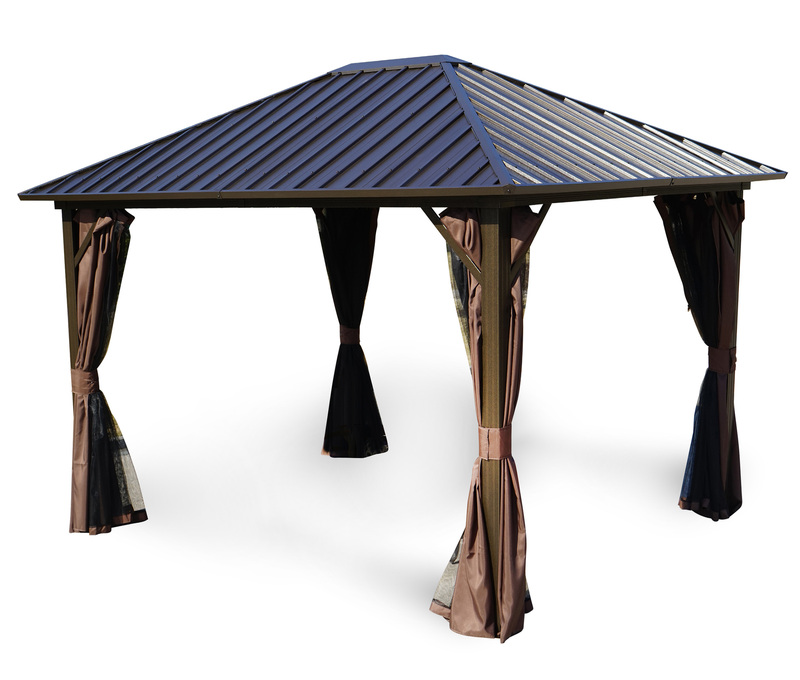 Due to the dark color of the item and high heat conductivity of aluminum, the gazebo may heat quickly under sunshine and reach a high temperature. This temperature depends directly on sunlight intensity. Kozyard does not have liability for any losses caused by a misunderstanding of the dimensions of the gazebo. The given dimension 10*12 of the gazebo describes the measurements from eave edge to eave edge and not from pole to pole. For more details regarding item dimensions, please check the specification sheet. Kozyard has no liability for damage caused by an overload of snow and wind on the gazebo. Please check the snow capability and wind rating specifications. 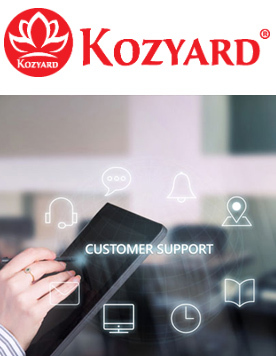 Kozyard has no liability for losses caused by installation error. Please be certain that the four anchoring stands are sturdily anchored into the ground. Kozyard does not have liability for the impermeability of the item roof after installation. 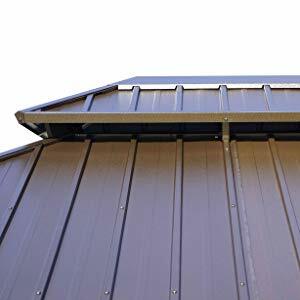 The waterproof performance of the roof system is closely related to installation.